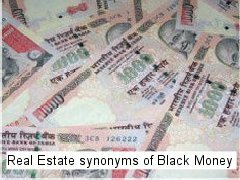 Black money refers to money removed from the official economy (via corruption, bribery, tax evasion, etc.) and stored in terms of cash within or outside of the country. Any monetary transaction which is done in cash and not shown officially on any documents is source of generation of black money. Real estate is market in which sources confirms that 50 % business are done in cash. Most of real estate developers do so in order to save tax which is actually wrong. If you try to approach any builder they will say openly that terms of payment will be 40 % in while 60 % in black like that. Unfortunate No transparency exists in real estate market. Some of developer still prefers to have 100% white money transaction but that are only few. As per process builder/developer has to take approvals from different agencies in government/municipality at each sate malpractice/ bribery is involved, which cause builder to pay money in cash to get approval for project. Builder is passing on this burden to customer. In order to save Tax and hide white transaction seller is asking for black money. Builder/Developer has to make payment to other supplier like cement, steel building material supplier in cash which force builder to ask black money. We will try to discuss briefly effect of black money in real estate market. If you closely observe in many rural area price of land has gone extremely high because of this black money, hence many farmers prefer to sell their agriculture land and live life like rich person, rather than doing farming. Consider that if majority farmer does this it could create alarming situation, if we don’t do anything than food security will be under threat. Now consider the case if middle class person wants to purchase home. He selects home worth 30 Lakhs while asking payment terms builder usually ask payment for 50 % in black by cash and 50% in white by cheque. So total amount required for purchasing this house is 15 Lakh in black, 15 Lakh cash and additional amount required for registry. If person is salaried person who has only white income, he/she usually plans to purchase home by taking “Home Loan”. Bank usually provides 85% loan sanction of total property value, hence for above case one will get loan amount on white value declared for property i.e for 15 lakh declared value one will get loan sanction for 12.5 lakh. So one has to arrange for 15 lakh black amount (cash), 2.5 lakh white amount for down payment & 1.5-2 lakh for registry apart from home loan amount for purchasing home worth 30 lakh, which is somewhat unsustainable for middle class people. Make arrangement of this amount. Increase loan amount by making document of extra work. Forget that house and search for another. Now a days buying home is becoming out of the reach for middle class. Conclusion:- Real estate has become most popular parking place for all illegal wealth (Black money) , which causes terrific effect on middle class people who want to purchase home. Government must take some action by means of making policy changes or by passing bill, to reduce / nullify flow of black money in to property market. Loan Against Property – Should you opt? Real Estate Bill Approved – Good days are back for real estate? magnificent submit, very informative. I’m wondering why the opposite specialists of this sector don’t notice this. You should proceed your writing. I am sure, you’ve a huge readers’ base already!